Carbohydrates are nutrients that provide energy for physical activity and cognitive function. However, these nutrients also elevate blood-sugar levels. Frequent consumption of foods and beverages high in carbohydrates may contribute to diabetes, weight gain and hypoglycemia, according to Phyllis Balch, author of "Prescription for Nutritional Healing." Carbohydrates are primarily found in plant-based foods; however, dairy products also contain these nutrients. Breads are among the foods most commonly associated with carbohydrates. A slice of white bread contains about 14 g of carbohydrates. Whole-grain bread is only slightly lower in carbohydrates -- one slice contains about 13 g. Bagels are particularly high in carbohydrates -- a plain, white bagel provides about 35 g of this nutrient. Starches are a form of carbohydrate -- like the carbohydrates found in breads, starches can elevate blood-glucose levels. A large baked potato contains between 60 and 70 g of carbohydrates. A 1-cup serving of either corn or sweet potatoes provides about 30 g of carbohydrates, as does a medium plantain. Legumes are high in fiber, which is a type of carbohydrate. 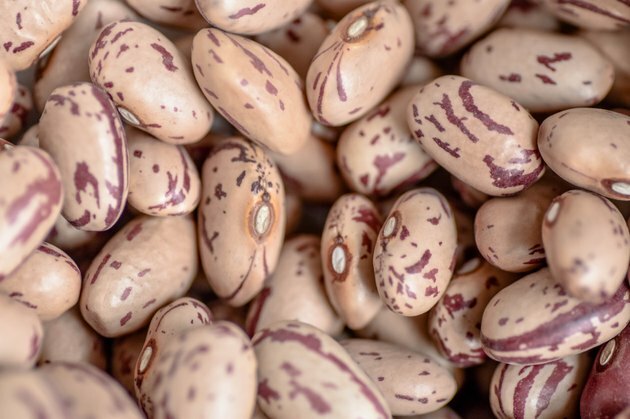 A 1-cup serving of cooked black beans, pinto beans or navy beans contains about 45 g of carbohydrates. A 1-cup serving of lentils provides about 40 g of carbohydrates, and the same-sized serving of black-eyed peas contains about 30 g. Chickpeas, which are commonly used in salads and hummus, contain about 50 g of carbohydrates per cup. Several beverages add carbohydrates to your diet. A 1-cup serving of orange juice provides about 30 g of carbohydrates. The same-sized serving of skim milk contains about 12 g. Energy drinks are also typically high in carbohydrates; a 16-oz. can of Monster Assault energy drink, for example, contains about 27 g of this nutrient. Are Green Peppers Low in Carbohydrates?